Moon Monkey, still searching for the way up to the moon, is going high again this September, towards the highest peak in the world. Join Moon Monkey, on their trek to Everest Base Camp 5,380m passing through the Himalayan mountain range, in the Khumbu region. The journey holds an infinity of discoveries. 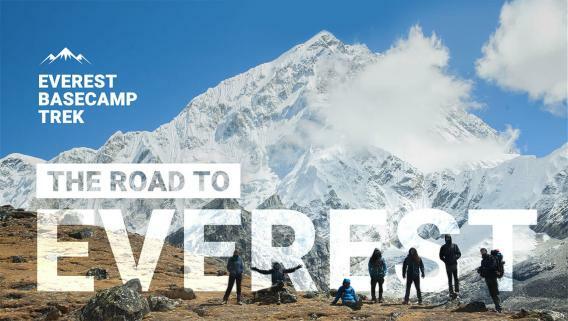 The iconic Everest Base Camp Trek leads us through the Khumbu Valley, revealing the immense beauty of the surrounding Sagarmatha National Park while simultaneously providing breathtaking views of the highest peaks in the world – Mt. Lhotse (8,516 meters), Mt. Makalu (8,470 meters), Cho Oyu (8,201 meters), and Mt. Everest. Aside from the immense scale, we will get to meet the Sherpa culture by visiting monasteries and museums along the way. We will be trekking through forests, rivers, rocks, ice, snow, and more rocks. And be rewarded in the evening by hot food, cooked from local products by local people, with oh-so much love! We will live together for 14 days, sleep in villages, do our laundry, and take hot showers in freezing temperatures. We will share laughs, stories, meals, rooms, and definitely farts.